This is the first half of a long road trip. For the other half, refer to my Ruby Dome report. We drove east on I-80, dropping onto US-50 at Fernley NV. This is a pretty fun place, where there's a three-way intersection where all highways are US-50, two parallel US-95's 20 miles apart, and several intersections between 50 and 95. Just keep following signs to Fallon and Ely, and perhaps keep an eye on your GPS or compass. US-50, once you get on it, is a great 2-lane highway. We spent the night just off a dirt road near Austin Summit, which was high enough to get some altitude acclimatization overnight, then drove on through Ely to the park. Mixed forest at about 9200', following Baker Creek on the Baker Lake trail. Baker Lake lies in an impressive cirque, mostly surrounded by cliffs that had small snow avalanches running almost down to the lake. We camped on the other side (at waypoint BAKELK, 10600'), well protected from overnight winds by substantial trees. The next morning we left camp at 7am (3 hrs after first light) and headed up the block and talus slope directly toward the higher of the two Baker Bumps. 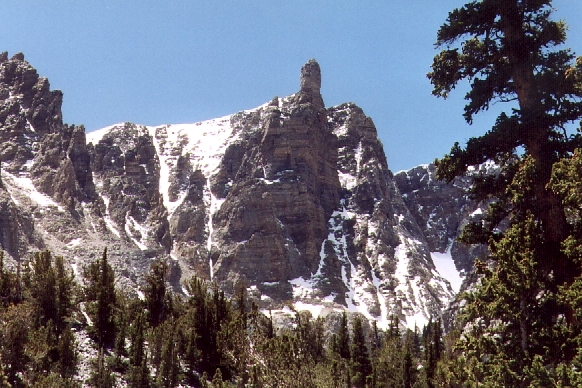 The named summit is a few feet lower (waypoint BAKERP, 12298'), but visited about 5 times per year. The high point (waypoint BAKEHP, 12305') had a register (just in a chewed-up plastic bag) with no entries for the last SEVEN YEARS. We spent over an hour on top, but still it was only 9:30am when we left. Looking at the higher summit of Baker Peak from the named summit. Dropping to the saddle between the two Bakers (12100'), we got a nice view of the cliffs between them and Wheeler. Then we followed the ridge over the named Baker Peak (half an hour from the high point) and turned north to Wheeler, dropping to 11800' along the way. This route is also mostly talus, with some large blocks, in spite of the ranger's scary warning about it being scree and really hard to climb. They are trying to protect inexperienced tourists, and only relented when we told them we had climbed Denali together. 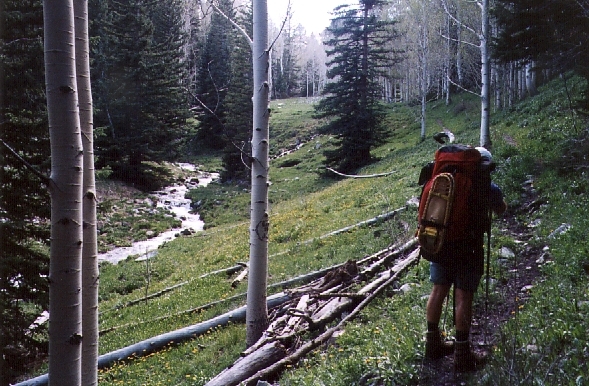 The best footing is on or very near the ridgeline, which isn't obvious on the way up. Wheeler Peak (the high point of Great Basin and the Snake Range at 13063') is sort of just another bump on the ridge. 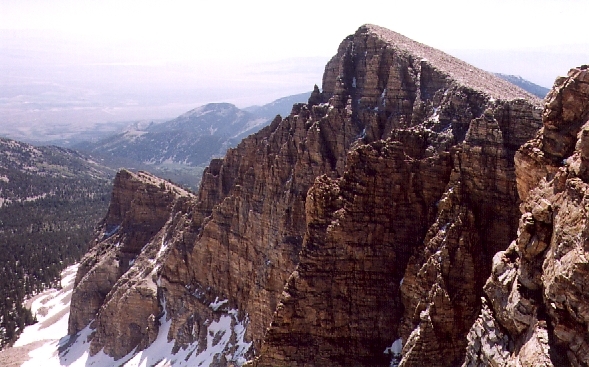 The USGS renamed Wheeler from Jeff Davis Peak to honor one of their own, re-assigning the original name to a forlorn secondary summit with no pleasant approaches. The summit register is in a regular USPS mailbox, which we pounded back into shape with a rock so the door would close, and it is visited VERY often. It's only a 3000' dayhike from the higher tourist trailhead (which sometimes doesn't open until mid-June, but was open on the 5th of June this year. We got there around noon, but someone had been there at 10am on the same day. Looking at Wheeler Peak from the Bristlecone Forest (near the tourist trailhead). 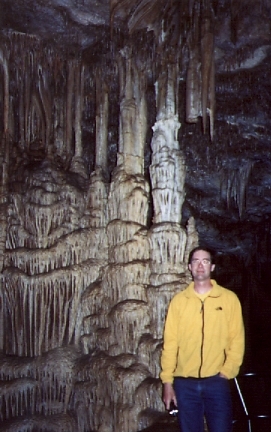 One of the large formations in Lehman Cave - smaller ones are too intricate for low-res web pics. The Lehman Cave Tour is not to be missed. It starts from the Visitor Center - just follow the signs from SR-487 in Baker (up SR-488 past some pretty dismal looking businesses). The cave is not huge, but the quality and variety of features is amazing (and at 50 degrees inside, a welcome break from the sun on a hot day). Cheap, too, with the longest tour being well worth the extra money. Do take spare batteries for your camera, right Tim? A big flashlight will help also, as lighting is dim inside. Skip the bristlecones, the ones on White Mountain (near Bishop CA) are WAY better.